What happens when you have a device such as an Energy Meter that supports Modbus and you want to use it in a BACnet system? You need a protocol to protocol gateway. 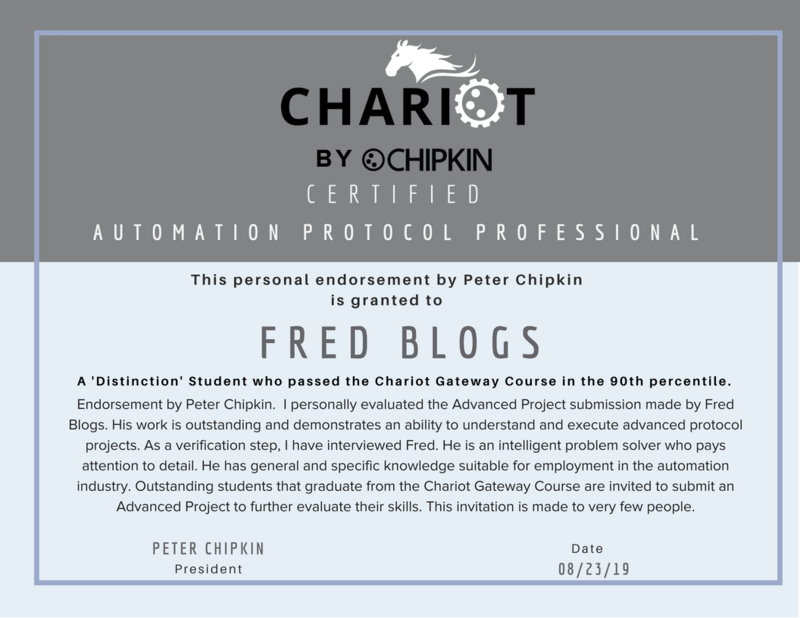 The Chariot Gateway Course is a program designed to teach the fundamentals of protocol to protocol communications from a practical standpoint. Upon completion, you will be able to understand a devices’ Modbus points, map them onto BACnet and implement a gateway which exposes the Modbus data as BACnet data allowing read and write operations. With the course, you will receive a Chariot Gateway by Chipkin. This protocol converter is a virtual gateway that runs on any Windows computer. It can be used for training as well as deployed in an operational device. This industrial automation training course will teach you how to complete an integration with the two most common Automation Protocols, BACnet and Modbus. Click here for more information. If you work or plan to work in automation, integration or instrumentation, you need skills to connect foreign or legacy devices. Enhance those skills with this FREE industrial automation training course. 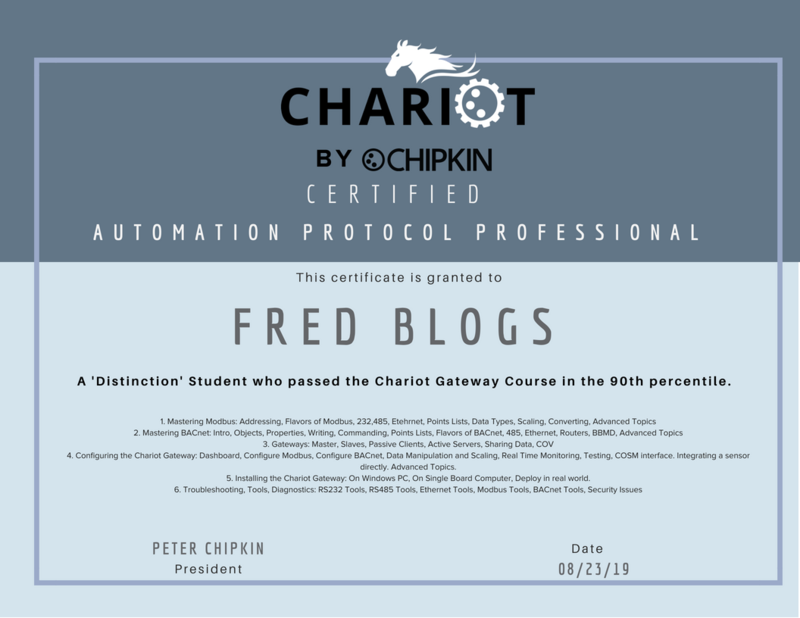 Click Here to Take the Chariot Gateway Course! CHALLENGE THE EXAM!! If you are well versed in Protocol to protocol communication and prefer to challenge the exam, please CONTACT US. Real world skills: Hands-on skills that employers want focused on practical non-theoretical issues. Modbus: Learn jargon, addressing, scaling, conversions, RTU and TCP, learn how to troubleshoot, perform diagnostics and use Modbus tools. 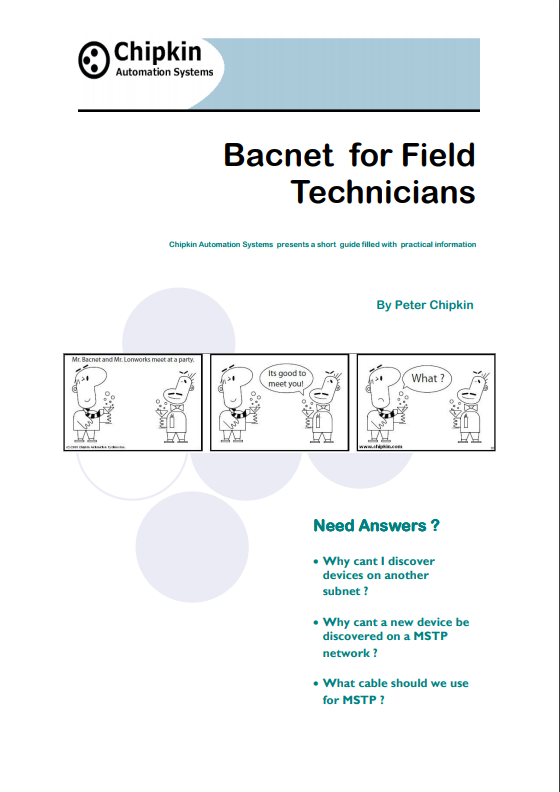 BACnet: Learn jargon, discovery, exploring, objects and properties, flavors of BACnet, troubleshooting and tool use. Gateways: Learn concepts, scaling, monitoring, diagnostics, how protocols share data, conversions, bit extraction, packing, arithmetic operations, configuration, monitoring, and troubleshooting. Also learn Security, networking, 7-layer OSI Model, RS485, RS232, Ethernet, TCP/IP and UDP. Credential from a Company with a big reputation in protocols and automation. Certificate from Chipkin on passing the exam. Additional certifications and letters of reference for students with top marks. Top students are invited to do an advanced project. This work will be personally evaluated by Peter Chipkin. If the work shows excellence then you will be interviewed by Peter Chipkin. On completion, you will be provided with a Certificate of Endorsement. Elite Students will Receive A Personal Endorsement from Us! Students who show excellence will also be invited to a challenge exam and interview. The interview will be conducted by a Chipkin Engineer or Peter Chipkin himself. Based on the results and interview, a determination will be made if you are an elite student. If you are, then Chipkin will endorse you on LinkedIn, provide a letter of reference and provide a certificate with a personal endorsement from Peter Chipkin. None. You do not need previous experience. Free!!! The course and the exam are free. There is no fee of any kind except for those who require a paper copy of the certificate mailed to them. You may keep, copy and use the virtual gateway we provide. You may use it for training, learning and you may also deploy it (and copies) in real-world situations doing real-world work. It is not a toy! We will show you how to install it on an inexpensive single board computer (lattePanda). Free 2-year license to the CAS BACnet Explorer. You can complete the training in a day or take as long as you like. It is an online self-paced program. The Exam can be completed in a couple of hours and It is multiple choice. For the challenge/advanced exercises, they will take several hours each. Chipkin Automation Systems will make job offers to outstanding candidates. Your location is not important as long as you have a good internet connection and can communicate well in English. We have employees working from remote locations outside Canada and the US. With a certification from Chipkin Automation Systems Inc., a Canadian company with fortune 100 clients, you are arming yourself with a useful and practical skill set – this is what employers want – people with hands-on skills and experience that are job ready. Mastering Modbus: Addressing, Flavors of Modbus, 232,485, Ethernet, Points Lists, Data Types, Scaling, Converting, Advanced Topics. Mastering BACnet: Intro, Objects, Properties, Writing, Commanding, Points Lists, Flavors of BACnet, 485, Ethernet, Routers, BBMD, Advanced Topics. Gateways: Master, Slaves, Passive Clients, Active Servers, Sharing Data, COV. Configuring the Chariot Gateway: Dashboard, Configure Modbus, Configure BACnet, Data Manipulation, and Scaling, Real-Time Monitoring, Testing, COSM interface. Integrating a sensor directly. Advanced Topics. Installing the Chariot Gateway: On Windows PC, On Single Board Computer, Deploy in real-world. Troubleshooting, Tools, Diagnostics: RS232 Tools, RS485 Tools, Ethernet Tools, Modbus Tools, BACnet Tools, Security Issues. The Chariot Gateway is a FREE software protocol converter that runs on a Windows 10 Operating system. Any devices with the Windows 10 OS should be able to load the Chariot software and act as a protocols converter. The protocols supported by the Chariot gateway are BACnet IP and Modbus TCP with a maximum limit of 5 points. Once loaded onto a device, the Chariot Gateway is a fully flushed protocol converter that can be used in any system to integrate BACnet IP and Modbus TCP devices. Follow the training video bellow to learn how to configure a protocol gateway. This gateway will allow you to take Modbus points, map them onto BACnet and implement a gateway which exposes the Modbus data as BACnet data allowing both read and write operations. You can purchase a hard copy of this book from Amazon or you can download the BACnet for Field Technicians for free from our website. Purchase a FieldServer or CAS Gateway from us that contains any BACnet protocol and we will help you test and document the BACnet interface by providing a free full license to the CAS BACnet Explorer and a Hardcopy of the BACnet booklet. The USB key and booklet ships with the product. Interested in working for Chipkin? Our customers expect skilled people. We are hiring qualified candidates. You are required to pass a qualifying exam before we will consider your application. If you need to, take the course first. We are hiring in India, Pakistan, and the Philippines. Chipkin has previously provided assistance to selected Indian employees with respect to immigration to Canada (where Chipkin is based). Selection was based on quality of employment service, ability to communicate, and the desire to move to Canada as well as eligibility in terms of Immigration Canada requirements. Candidates must be fluent in English. You do not need a degree or formal training, but, you need to have the skills we need. We are in the business of machine-to-machine communication. We enable the transfer of data between systems that talk different digital languages. Chipkin is a good employer and people like working for us. We will provide respect, opportunity, and reward. We are outcome oriented. We don't care about your previous employer or your previous education or training. We care that you have the right skills. That you can do what out customers need done. Prove it to us. If you feel you are already qualified, go ahead and take the test right now. Email and ask for the "Applicant Skills Test". If you're not sure, then take the course first then and then do the Skills Test. Or, skim the course to see if you know the material. Chipkin™ is a building and industrial automation protocol expert. We develop, configure, install and support gateways (protocol converters), data loggers and remote monitor and controlling applications. Founded in October 2000, Chipkin provides expert solutions for converting BACnet®, Modbus®, and LonWorks®—to name just a few—and enabling interfaces for HVAC, fire, siren, intercom, lighting, transportation and fuel systems. The high-quality products we offer (including those from other vendors) interface with Simplex™, Notifier™, McQuay™, GE™, and many others—so you can rest assured that we will select the most appropriate solution for your application.